There's a good chance your TV is SMART and has some applications inside which allow you to watch TV - from the internet. But, you can also get those applications on a "Device" like an Apple TV or Roku. When Cable TV first arrived, it was simple. You just subscribed and they provided hundreds of channels. Now, the internet, allows you to "choose your own" content, in smaller bites, and probably save money. 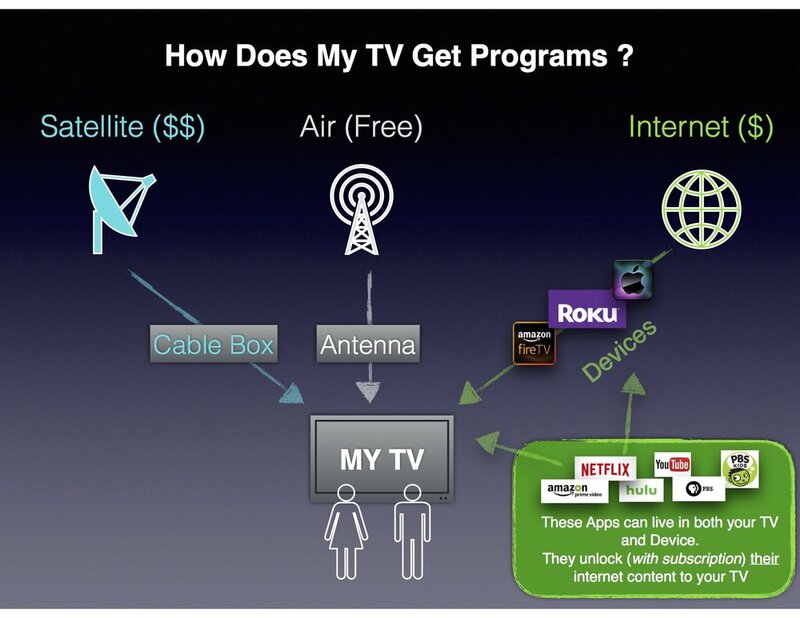 Various apps (usually requiring a subscription) "unlock" content on the internet so your TV can view it. AND, to confuse things even more - you can get a number of channels - absolutely free -with a simple antenna. Just like the "old days". Actually some great HD content. More on this on a later post. We tried to make this graphic as simple as possible. Why ? Because you may find that using a Device, with the internet, is cheaper than Cable/Satellite. There are a number of people using devices. You can actually get a Roku or Apple TV installed by a professional, at a reasonable price.